It is expected that advancements in technology will make solar and wind energy a viable alternative to fossil fuels. 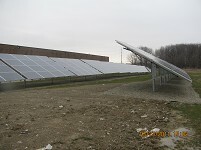 The City of Bedford has legislation in place which regulates and requires approval of such installations. All systems, including small residential systems, require approval from the Building Department to determine compliance with the National Electrical Code and Bedford Ordinances.